11.10.10 - Discover the distinctive style and flavour of Teacher's® whisky with the launch of a new dramcast presented by master blender Robert Hicks. The dramcast offers viewers the chance to learn more about the quality of blended Scotch whisky, how to taste it, and the fascinating production process behind one of the UK’s leading Scotch whiskies. The five minute dramcast, entitled Teacher’s® – The Generous Blend, takes viewers on a journey of discovery from the origins and rich history of Teacher’s®, through the craftsmanship and different stages of the production process. 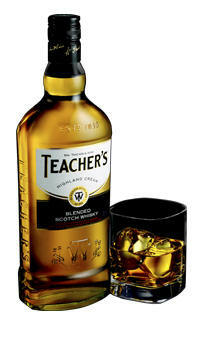 The dramcast also talks viewers through the quality of Teacher’s® and how best to enjoy it. William Teacher would not put his name to the bottle until he had achieved perfection, and to this day the Teacher’s® distillers work to the same ethos, using the finest ingredients to make the Teacher’s® blend: created without compromise. Below is the YouTube video telling us all about Teacher's Whisky and how blends are made from a number couple of grain whiskies and over 30 single malts. Excellent video to watch and very educational video about Teacher's Highland Cream and other very interesting facts about Teacher's whisky.